I signed up for an exercise class with a friend and ended up getting three good things for the price of one: exercise, laughter and socializing. I don’t need to go into just how great these three things are for health, stress levels and even longevity. Use your google-fu and you’ll find a whole lot of information. What I want to talk about is how much fun I’m having doing my new favourite exercise. 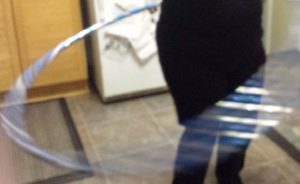 Hooping in the exact centre of the kitchen so as not to destroy anything! It’s hooping. Yes, hula hooping. My friend read an article about hooping in La Presse and found out that there were classes available in Ottawa, so we signed up. Admittedly, I was attracted by the novelty of it. I don’t know anyone else who has taken hooping classes. Then I saw the videos of people dancing gracefully with brightly coloured, sparkly hoops, like this one showing instructor Sophie Latreille. Even the first class was a surprisingly good workout in spite of all the times I dropped my hoop. Then there’s the laughing, delighted and surprised. It’s pretty funny watching women, teenagers to seniors, racing across the room at random times in random directions chasing hula hoops, especially when I’m one of them. If feels childlike and unpredictable. I don’t remember any other exercise class that was quite this much fun. Even with all the horsing around, I’m noticing improvements. I can make the hoop go around my waist long enough now that I stop because I’m tired, not because it falls off. I’ve stopped knocking my glasses off, mostly. And even when I toss the spinning hoop up in the air and then catch it haphazardly while covering my face with my arms instead of letting it come gracefully to my waiting hand as I planned to do, I’m still laughing. An image that still makes me smile weeks later is one of my friend and I waiting at the bus stop, then manoeuvring onto the bus with our sparkly red and blue hoops. Passersby and passengers either smiled or tried not to stare. I wonder what stories they were inventing as they watched us, two five-foot, middle-aged women laughing with large hoops in tow. There’s that third benefit: regular time spent with a friend. Whether we grab a bite after class or just chat at the bus stop is immaterial. What matters is that we’re face-to-face, talking, hanging out, caring. Exercise, laughing, social time. How grateful I am to have a friend who cleverly suggested we sign up for an activity that gets us both out and benefiting from these three things every week. It feels good. Plus it has sparkles. What else can I say? What’s your favourite way to get active, laugh and socialize? Send me an email and tell me about it, to susan at goodbyegrumblings dot ca, or leave a comment. Have a great week, and I wish you good things. I love my cycle class at the YMCA because of the instructor, friends, music and oh ya the excersise. I think a lot of people feel the same way. Thanks for commenting. Exercise is so much better when it’s fun. 🙂 Love to you and your family too Jenny! You are awesome – no, better than that, sparkly-awesome. I’m so pleased you are doing this, and that you told us about it. My personal activity has been limited to small walks to and from the bus. Fortunately, thanks to construction crews creating large holes in the ground, my bus stops 6 stops further from my work than it used to. I’m enjoying walking that bit each way, since it just doesn’t seem worth it to transfer buses for the extra distance. And I get good and sparkly sweeping up the kitchen – purple glitter still abounds at our house. What a positive way of looking at construction hassles. (-: Thanks for your kind comment. It always makes me smile when sparkles mysteriously surface after months!